A modern lounge chair that hangs to the extremes of contemporary, this upholstered accent chair features sleek running lines and crisp clean angles. Designed to convey a high end art style with a minimalist look, this contemproary chair will enhance homes with its fashionable styles as well as its ability to make rooms appear large, clean and un-cluttered. 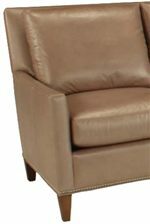 A plush upholstered seat cushion and pillow back adorn this chair with an element of comfort while exposed wood feet complete the piece. Available for purchase with its coordinating ottoman, this upholstered collection chair is available in fabric and leather options. The 1065 Modern Lounge Chair with Exposed Wood Legs by McCreary Modern at AHFA in the area. Product availability may vary. Contact us for the most current availability on this product.